Stop by and see Paperberry Lane here on Weebly and Like it on Facebook to stay updated on all of my latest pieces! This blog will be deleted as it is no longer used. If there is a project you like, be sure to save it as it will no longer be available on May 1st! Stop on over the most creative lane in town and say hi! Just wanted to take a second to remind everyone that this blog has moved and been renamed. You can now find Paperberry Lane here. You can still get all of my older projects here until they are moved to Paperberry Lane. If that wasn't sweet enough; you can also get your paper fix on social media at Paperberry Lane's Facebook page. Get on over and like us today! When I reach 100 "likes" I will be doing a random drawing for a five pack of handmade cards! Everyone can always use a few card on hand for that last minute gift! Like me on Facebook and let others know so we can get this giveaway goin'! If you happen to be looking for even more inspiration, don't forget to follow Paperberry's Pinterest board! A New And Improved Crafting Experience! I would like to thank everyone that has taken time out of the last year to visit my blog. While it has been a major learning experience for myself; I enjoy it so much! I love to be able to show off my work, teach and inspire others. My main goal is to show everyone that papercrafting can be fun, rewarding without spending a ton of money or investing a lot of money. Access to ideas, sharing with others, and learning should all be fun and easy. It is because of this that I would like to introduce to everyone...Paperberry Lane! Paperberry Lane has been my work in progress for almost two months! Starting today; all new projects will be posted on this blog which can be found here. Not only is this a new and improved blog featuring new projects, new look, and newly added discussion forums, but...you will also be able to find and connect with Paperberry Lane here on Facebook! And of course you will also be able to stroll down my lane on Pinterest! That's right! You know have Paperberry Lane and all of my wonderful projects as well as inspiration from others without having to search the internet! Starting today, all new blogs will be posted on the Paperberry blog. However, I will keep this blog active a few months to direct traffic to the new and improved sites. If you would kindly take some time, take a stroll down my Lane and check out what there is for you to see and do! And as always...pass any of these along to someone who also may appreciate their dose of papercrafting! There are always room for more on this Lane! I hope you all enjoy the new and improved sites and ease-of-use! I also hope to have my Etsy store changed to reflect Paperberry Lane with new merchandise. One last announcement: I will becoming a Stampin' Up! demonstrator in the next month or so! I have been tossing this idea back and forth for a couple of years and I've finally decided to take the plunge and do it! I look forward to getting some parties booked and bringing the amazing products that Stampin' Up! offers to Paperberry Lane! Lastly...I find that I am not a talented watercolor artist, so I reached out to a co-worker who also happens to be a very talented artist to do the Paperberry Lane artwork! Please check out her site here! She's so talented and is available to do free-lance work! Thanks Jenn! Your work turned out great! Sweet News In One More Day! I still have more work than I probably should for the big reveal so I'm gonna get back to it! But be sure to check back on Thursday so you don't miss out on it! The one year anniversary is almost here! It is incredibly hard to believe that I've been imagining, creating, posting and blogging for almost a year now. I've learned a lot! Like...there's a lot of work that goes into doing this. And also, no matter how much I plan, I still can't get stuff done on a strict schedule, and of course, you can't rush perfection! 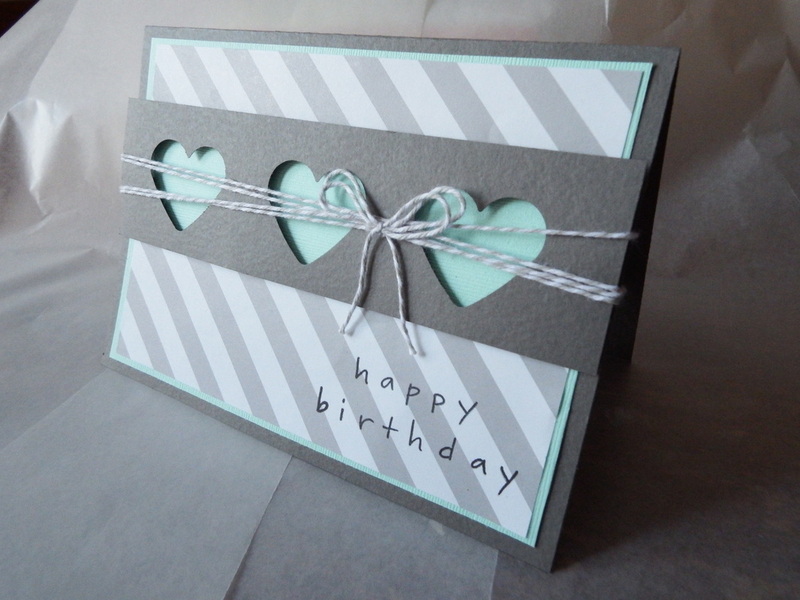 This card features my new go-to neutral base color: gray! I love the versatility of this card. In my opinion, gray is a very underused card that doesn't have to be boring, blah, dark. If you pair it with a brighter tone or accent and embellish it right, it can be a great color to keep on hand and in the back of your mind. This card literally came to me in my sleep. And by sleep, I mean while I was lazily dozing in my recliner yesterday morning. I had to be up at 2 a.m. for work so don't judge :). I have really been on myself for getting around to buying a journal so that I may write ideas and sketches down as they come to me because my memory is horrible. I was very proud of myself for still remembering this one after I woke up! Soon, we will all be diving head first into Valentine's cards, St. Patty's Day, and before you know it, it will be time for Mother's and Father's Day cards! But before you begin on those, you may want to get some Thank You cards made and sent for Christmas. The holiday season can be expensive, busy and stressful, so why not give a proper thanks to those who have taken time to buy a gift, host a party or for those that have just been there throughout the season. Now, just because you're sending Christmas thank-you's doesn't mean that they have to be holiday themed. In fact, this is a good way to jump start your post-holiday creativity. This card features my new go-to color: gray! As I mentioned before, I have a hard time motivating myself to move on from my favorite crafting time. It's hard to find inspiration after all of the glitz and sparkle of the Holiday season. 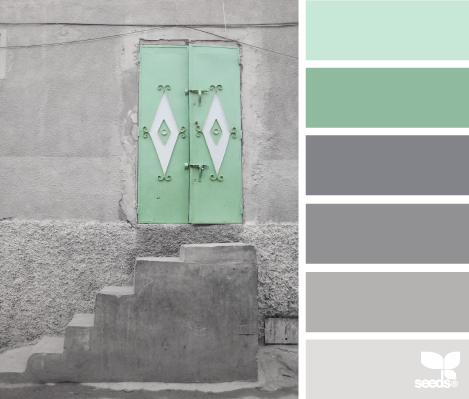 My inspiration to move on happens to be my color pallets rather than a particular occasion or project. So...I thought I would share with you my go-to colors for the new year! Up first is this navy and pink combination. I love the contrast and the look of this. This would be a cute combination for a new baby girl card, birthday card or almost anything you can dream of. I think navy is a very underused color so let's give it some time to shine! As another side note...wouldn't this look great with some gold sequins or stars for a great shaker card? Or embellished with just a touch of gold? Love it! Next on my list of inspirational colors are gray and teal (aqua) tones. I love gray! This is definitely an underused tone that has gained some popularity recently. The best part? It goes with EVERYTHING! This is a great color to add to your stash as a base or neutral color. New Year and New Ideas! The old year has came and went. It's hard to believe but it's 2015! For me, moving away from Christmas crafts is always difficult as it is my favorite time of year to craft. I am usually slow to start new projects as the visions of sugar plums, Christmas stamps and all things that glitter are still at the forefront of my mind (and still all over my craft area). I decided to jump right into some new crafts on New Year's Eve and leave all those Christmas ideas in last year (until I begin crafting for craft show season 2015...so maybe only a couple of months at the most!). What better way to kick off the new year than with some new projects and classes?? As an instructor, I am now allowed to customize and create my own classes! I have decided to add three new classes for the months of January and February. I haven't decided if I will continue these into March, or come up with another fresh idea. All classes can be taught to anyone, even though they are listed as beginner or advanced. So, take a look at the new projects and sign up for a class today! The new classes offered are: A dimensional shaker card, and a beginner flower pot card, as well as an advanced one. Here is my version of the shaker card. This classes teaches you to how to create and leave with your very own shaker card! These are so fun, as you can create them in any pattern and fill them with almost anything! This card can be created for any occasion. These beauties are the flower pot cards! 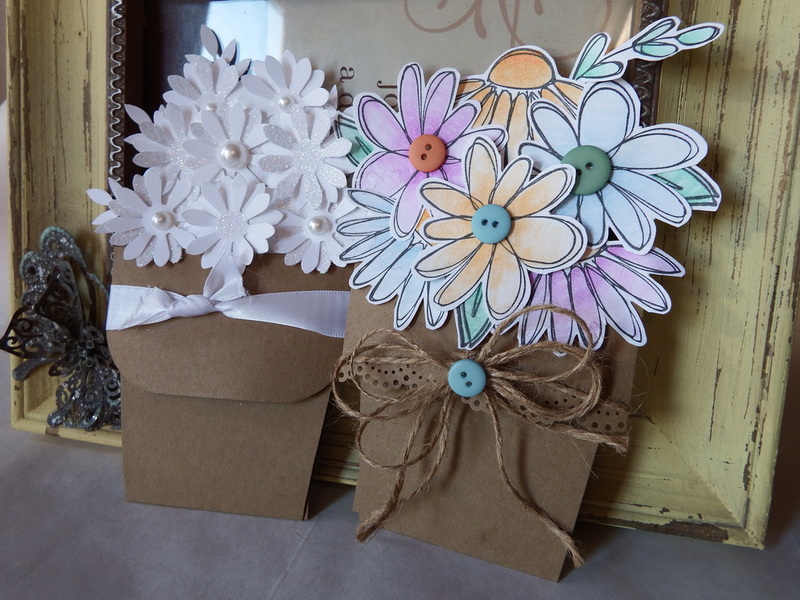 The one on the left is a punched flower version that is geared more for a beginner and the one on the right is a stamped and colored version; geared more towards an advanced paper crafter. Many of the items needed for these classes are provided with the exception of paper, adhesive and any small embellishments. If you choose to take a class; you only need to pay for the price of the class any of those items you may need that you don't already have! I have chosen to keep the cost of supplies low as I feel the cost of the class is enough! It should never have to be expensive to learn a new technique or enjoy a class! I hope to see some of you in a class soon! Also...mark your calenders! Saturday, January 10th is the Classroom Open House where I will be available from 11-3 to answer all questions and show off some new creation! Merry Christmas to all of you that have visited, shared and been inspired from my page! I appreciate all of the visits, shares and attention that has been brought my way! This blog started almost a year ago as a creative outlet for my crazy, crafty life! 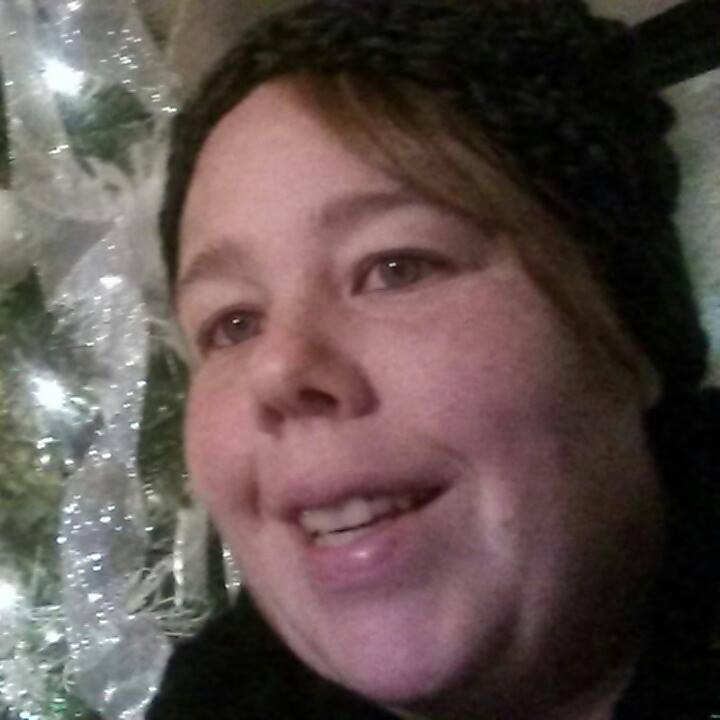 I'm so very thankful to have all of you to share my journey! Not to waste anymore of this precious day...enjoy it, spend time with your families and maybe get a little crafty? I'm gonna try to sneak some time in later this afternoon after the day slows down a bit! Thank you all again for all of your support! Today is the day! Today is the last day of my 12 Days of Christmas Card countdown! The time has flown by and it's even closer to Christmas! But don't worry, there is still time to make and send those cards, get those treat bags and boxes decorated and make some handmade ornaments! I have really enjoyed my time creating and showing off my designs! This countdown has forced me to step outside my comfort zone and even expand on some techniques that I was already familiar with. I hope I have been able to inspire you to create your own card...even if it's just one card! Handmade cards can be just as beautiful, if not more so that store bought. Today's card is a sort of culmination of designs. I used many techniques in creating this card. I used many different techniques such as heat embossing, dry embossing, stamping, paper punches, paper piecing, and bow making (which I'm still trying to master). The main focus of this card was created entirely by me using all of these techniques and pieced together to create one larger piece. This card originally started out as a white and red, peppermint themed card, but as you can see, it ended up being what I would consider as a grown up sugar coated candy card...and I couldn't be any more pleased with the results! 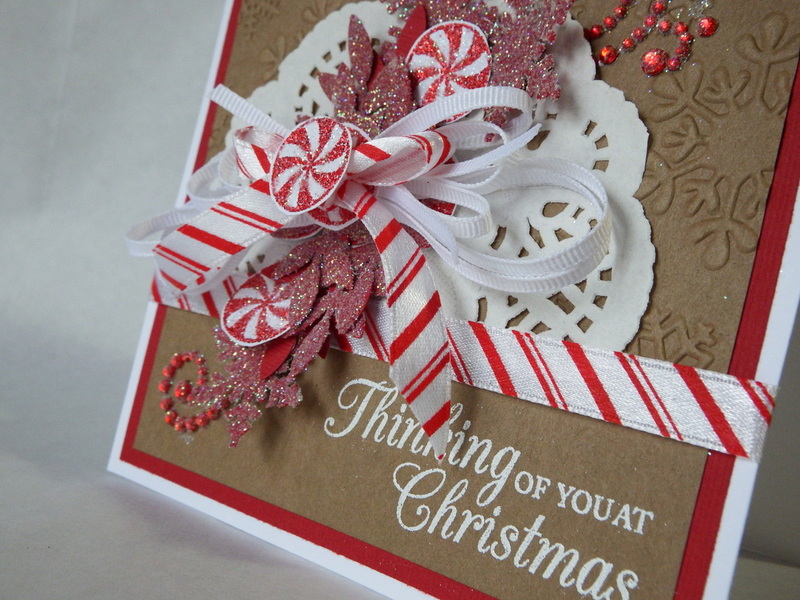 And besides...the brown makes me think of chocolate; so I guess it could be a chocolate peppermint card! Now, I want some. 1. Create cardstock base. Mat with two different colors; each one 1/4" smaller than the previous. Make sure that you dry emboss the top mat prior to adhering. I left the bottom of the top mat smooth so that I could stamp my sentiment later. Wrap ribbon where the dry embossing stops and adhere with adhesive of your choice. 2. Trim a small paper doily, almost in half, and adhere just at the top of the ribbon. Place rhinestone swirls just under the doily so that they appear as they are behind and coming out from behind. Take a glue pen and rub on the rhinestones, being careful to avoid the cardstock under them. Sprinkle with very fine white glitter. The ultra fine white glitter is key to giving your punched pieces the sugar coated effect. You will run glue over all of your punched pieces that you wish to coat. 3. I punched out my snowflakes and leaves, both using Martha Stewart punches from previous posts and glittered them. My peppermints were stamped with Versamark and heat embossed with red glitter embossing powder. I ran a glue pen over the white areas and sprinkled with the same ultra fine white glitter to give them a sugared look, also. 4. 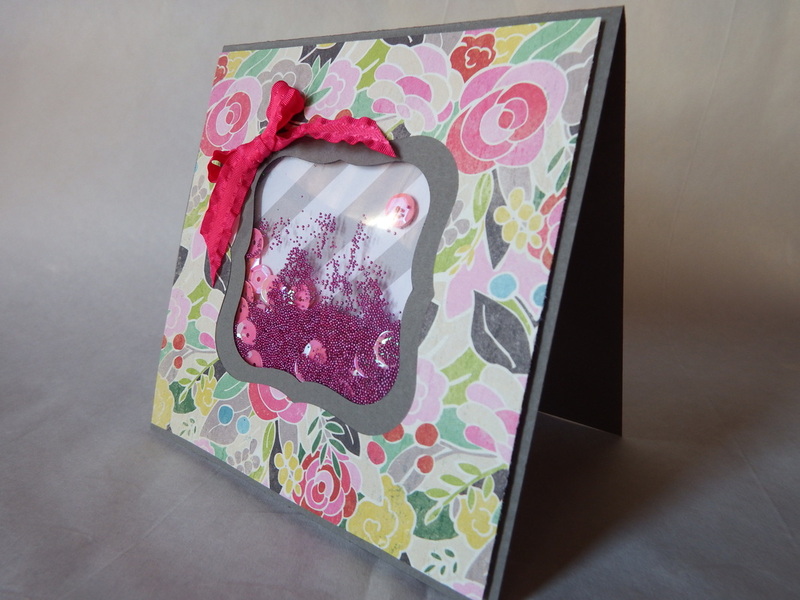 After you have all of your pieces punched out and glittered, arrange them how you like and adhere them together to create one large focal point for your card. Adhere to your base. 5. Stamp your sentiment in the smooth area below your ribbon. Stamp with Versamark and heat emboss with white embossing powder. It is true that time does fly when you're having fun! I can't believe that we are already at the second-to-last card in the countdown. I really hope that everyone has enjoyed looking at all of my designs and that I've been able to inspire at least one person. This is another card that breaks me out of my usual card routine. I'm not normally a fan of gold but I notice a lot of it in trends this year. Take inspiration from things around you, such as fashion, pinterest...almost everywhere! I bought this stamp set and I wasn't sure what I was going to do with it; I tried coloring it and wasn't happy with the results and then it hit me out of the blue today...gold! My Metallic Holiday Card also reminds us of something that can be overlooked many times....the inside of the card! I chose to do only design on the outside and stamp my sentiment in the same gold emboss on the inside rather than outside. This is a great way to put something on the inside and not have to worry about what to write. Just stamp, sign and go! Well, let's get to it! 1. Cut your white cardstock base and fold. 2. 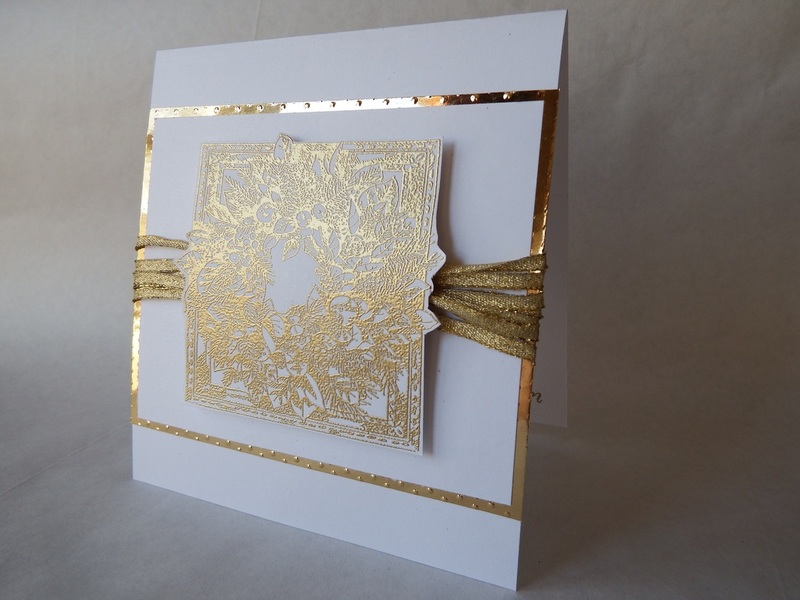 Cut your gold metallic cardstock and mat with white cardstock. Adhere these to your base. Using thin, gold ribbon, wind around the middle of your matted section several times. Spread out your ribbon that goes the sides and gather in the middle. 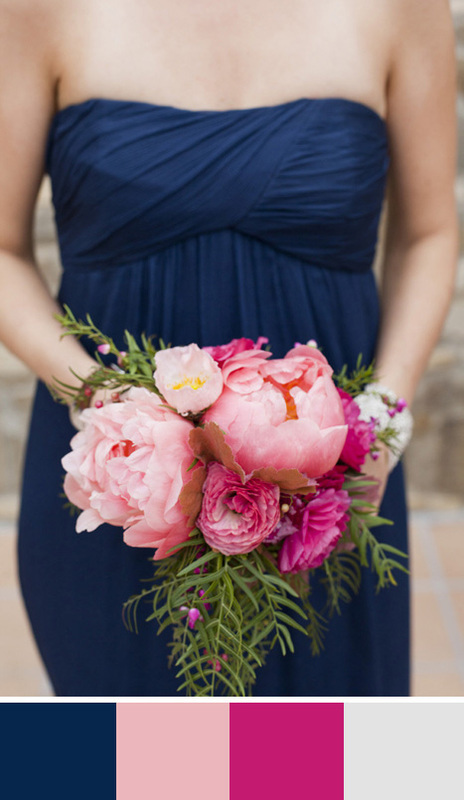 This will give your ribbon less of a bunched up appearance and more the effect of a bow. 3. Stamp your image with Versamark and heat emboss with gold embossing powder. Cut around image with very sharp scissors. Adhere image to card using foam adhesive dots. 4. To finish off your card; stamp your sentiment on the inside using Versamark and heat emboss with gold embossing powder. I chose to stamp mine in the bottom corner. Who says that it always has to be in the middle? But place yours where your little heart sees fit. I can't believe that my countdown is almost over already! I'm having so much fun showing off so many different cards, styles and techniques. This countdown has made me really branch out my creativity. I've had the opportunity to use new products, try some new techniques and even some that I thought I wouldn't like or be good at. Where am I going with this? Well, it's today's card that I'm really breaking out of my creative mold. This piece has a large picture on the front that required more coloring that I am usually comfortable with but I am really please with the end result. Today's card would make a great choice for a more masculine card or just a break from the usual snowmen, snowflakes, gingerbread, etc but still has the all the Christmas feel. While this card may seem difficult, it really isn't. The car and tree are colored with watercolor pencils. They are very forgiving and give you an uneven, watercolor look to your image. I don't like the streaky look of conventional markers and copic markers can be an expensive purchase. 1. Cut your cardstock base, create your fold and mat with piece of coordinating cardstock. 2. Stamp your image on white cardstock. To make coloring easier and to prevent bleeding from your blending marker; stamp with Versamark and heat emboss your image with black embossing powder. If you don't have these items or don't feel like embossing; simply be careful and don't spend too much time on the image itself with your blender pen so the ink won't bleed. 3. Color your image with watercolor pencils; blending with a blender marker. To create lighter shades and less visible pencil strokes, color a small spot on another piece of scrap cardstock, dip your blender in that and color as such. Unless you need a darker color saturation, this is how I prefer to color most of my images. To finish your image; dab glue over your ornaments and sprinkle with red glitter. Because...what is Christmas without some sparkle?!?! 4. Adhere your image to your cardstock base; making sure you leave space to stamp and heat emboss your sentiment under your image. 5. To finish; place three brads on the right top corner. This simple trick lets you fill in a bit of space without being too overpowering. Lastly, tie a coordinating ribbon on! Today's card features a super simple and clean design. This is a great card for a beginner to start their cardmaking adventure. This design only requires two colors of cardstock, 1 color of ink and embossing powder and Versamark if you choose to heat emboss the sentiment. 1. Cut your base from white cardstock and create fold. Cut a small section from ribbon and tie around the top of your card; creating a bow. 2. Using a snowflake punch ( I used Martha Stewart's Alpine Snowflake punch) punch at least 2 snowflakes out and place rhinestones in the center of each, set aside for later. 3. Cut a rectangle out of silver glittered cardstock; round the edges, this will be your mat piece. Cut another rectangle out, making sure it's 1/4" small than the silver one; round the edges. 4. Stamp snowflakes in a random pattern on the white cardstock, and place rhinestones in the center of them. If you choose to heat emboss; stamp your sentiment with Versamark then heat embossing powder to create your embossed sentiment. 5. 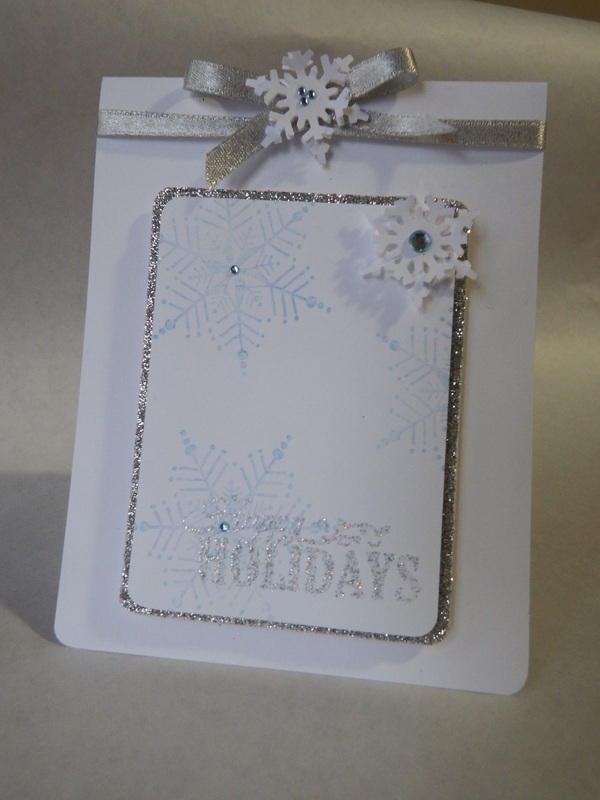 Apply one of your snowflakes to the top of your cardstock using foam dimensional dots. Adhere the white on top of the silver using foam dimensional dots. Adhere the entire matted center piece to the card base also using foam dimensional dots. 6. 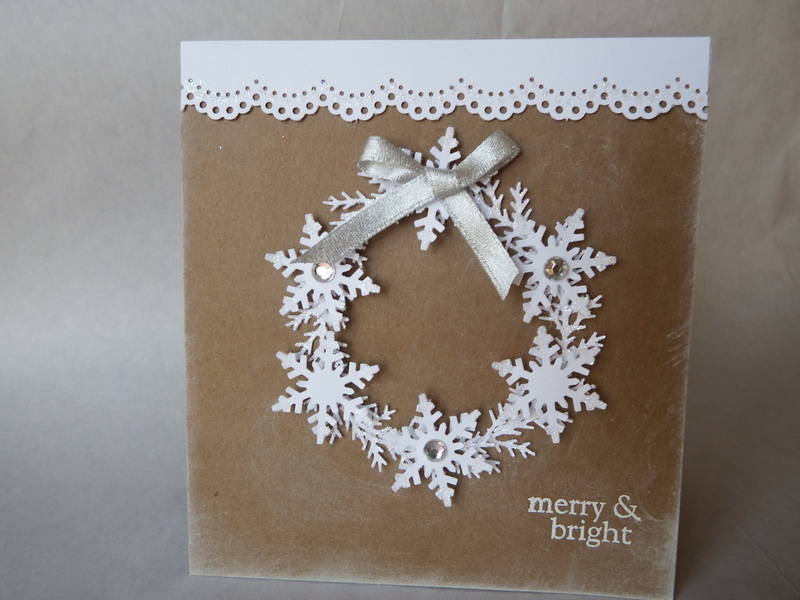 Lastly, adhere second snowflake to center of bow on the top of the card. My country snowflake card brings back my favorite color of this season...kraft! I love how this color adds style without being an overpowering color or taking away from anything you may use; even white! 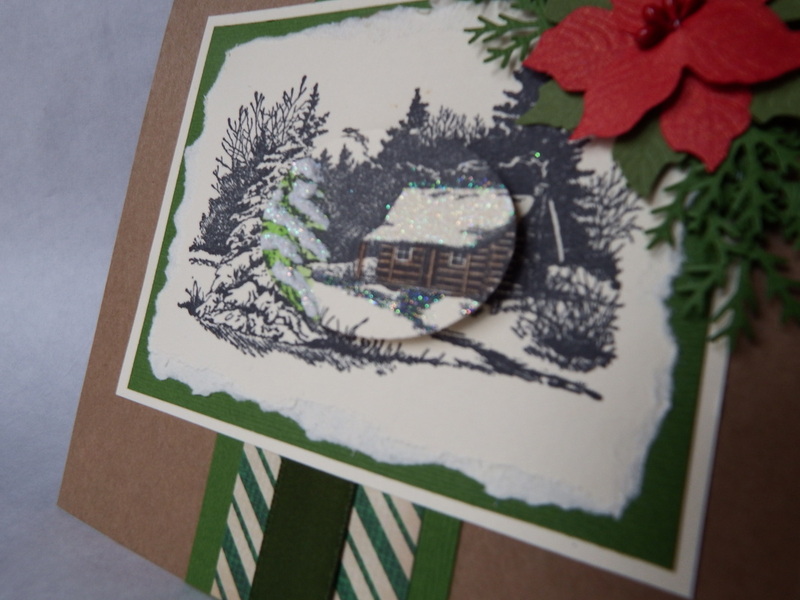 This cards uses snowflakes and the pine branch punch and combines them to give you another idea of a wintery wreath. Without using any Christmas-specific colors or theme specific symbols; this is also a great card to send anytime during winter for almost any occasion. This card has two of my favorite must haves for this season...kraft and snowflakes! Anyone who knows me knows that I LOVE (borderline obsession) snowflakes. So, let's get to it! 1. Cut and fold your kraft colored cardstock base. 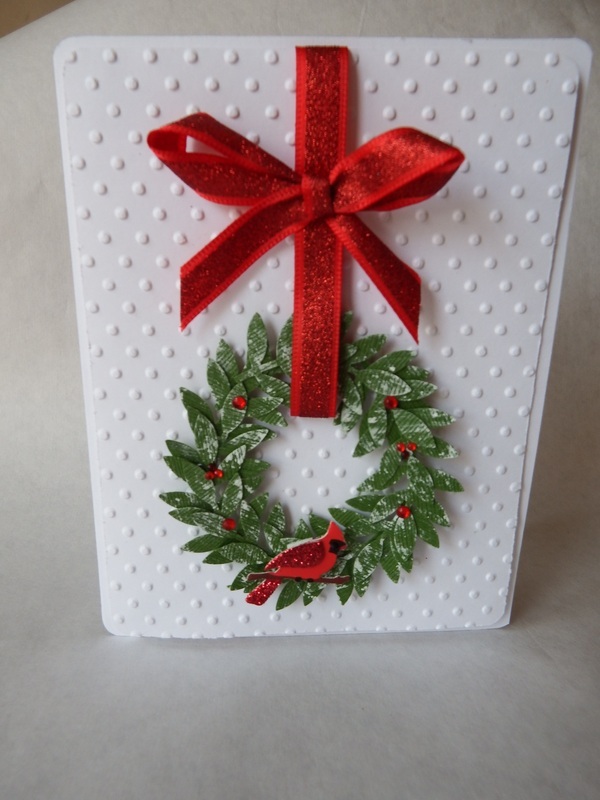 Using a paper towel and white acrylic paint, distress the edges heavier than the inside of the card. 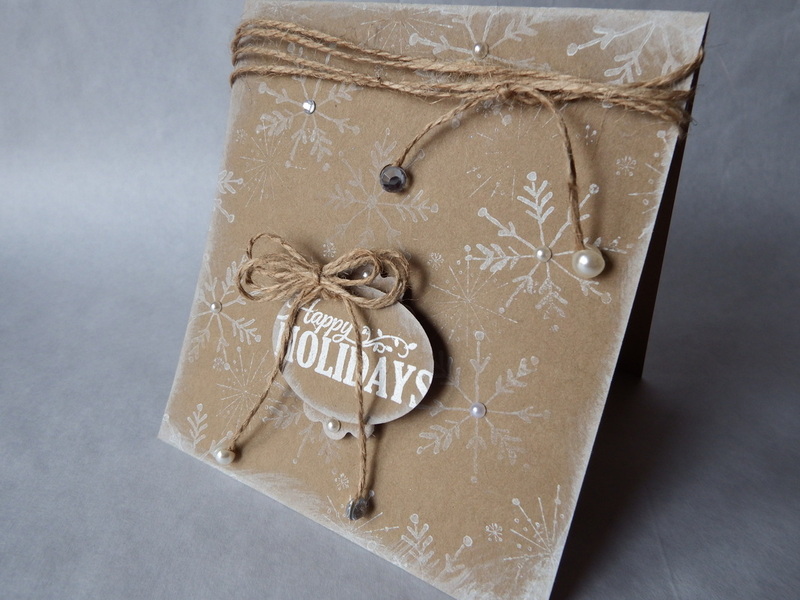 Stamp your sentiment in one of the lower corners using Versamark and heat emboss with white embossing powder. 2. Cut a one inch strip of cardstock and punch with a border punch. I used Martha Stewart doily edge punch. Then I added dots of glue with my chisel tip glue pen and sprinkled with ultra fine white glitter. Adhere your punched and glitter strip to the top of your card. 3. Punch out several branches of white pine branches (Martha Stewart punch again) and add glue and glitter to the entire fronts of all of them. Then create a circle by gluing them in a circle, overlapping slightly. 4. Adhere snowflakes to top of branch wreath, using small foam dimensional dots. I love adding dimension to all of my cards. I feel this gives it a finished look compared to most store-purchased cards! I chose to glitter the tips of all of my snowflakes, but you could leave this step out if you choose to. I used six snowflakes in total. Next, add clear rhinestones to the middle of three of your snowflakes. To finish your wreath, tie a bow from silver ribbon and adhere to top of your wreath. 5 To finish, simply adhere wreath to your card base! Today's card features another wreath. Yes, I do love them! And double score for me...I managed to make TWO cards without and kraft colored cardstock! I know; it's a shocker for me too! But have no fear because the kraft will be back in the very near future. There are certain symbols that many people associate with the holidays and wreaths are one of them. With a few simple supplies, these cards are easy to make and give such a great impact. Let's get to the fun part! 1. Cut cardstock base and fold to create your card base. Cut a mat in same color as base; round the corners and dry emboss with a dotted embossing folder. This could also be done with a stamp; heat embossed or a lightly patterned paper! Adhere to base with foam dimensional dots. Set aside until after the next step. 2. Punch several branches out of green cardstock using the Martha Stewart branch punch. To create wreath, glue each, overlapping the next in a curcular fashion, until you have a fully formed wreath. Using a paper towel and white acrylic paint, lightly distress leaves until you get something you are happy with. There is no wrong way to do this part so don't worry too much about messing it up! Adhere red rhinestones and cardinal bird (Jolee's) to card. 3. Take ribbon, wrap around top of your wreath and glue back. This will give the impression that your wreath is being hung from a door, window, etc. Adhere wreath with foam dimensional dots to your base and also adhere ribbon to base with adhesive of your choice. 4. To finish up, tie a bow using the ribbon that is hanging your wreath. Adhere about half way down the "hanger" ribbon and that's it! Firstly, my apologies for not getting yesterday's card up! I took a day to do some shopping with my other half and it ended up being and all day affair. It was nice being able to spend time together, child-free but I am certainly paying for it today! But...you now get two cards today to make up for my absence yesterday! So, let's get to it! Today's card features a simple design in colors that don't always come to mind as a holiday combination but look great together! If you love snowmen, glitter and cute little red birds, then this may be the card for you! 1. Cut base cardstock and creat fold. 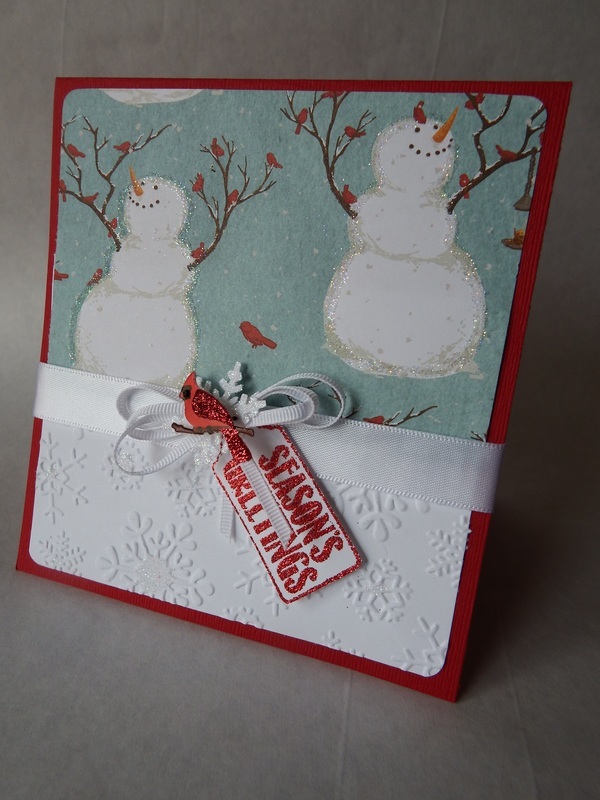 Mat printed snowman paper on top half-ish of card and be sure to round the corners to create the same look as mine. Go around the edges of your snowmen with a fine or chisel tipped glue pen and add fine white glitter to add some sparkle to your snowmen. 2. The snowflakes on the bottom were dry embossed on and a fine white glitter applied to the center of most of them. If you don't have access to a machine to dry emboss, you could heat emboss them on or even use another printed paper with snowflakes on them. OR even leave the bottom plain white. Any of these options would look great and work well with this design! 3. For the middle, I cut ribbon and adhered it. Next create a multi-looped bow to adhere to the center. For the snowflake, I used a paper punch and added glue and fine glitter all over the top, this will tie it in to the glitter on the snowflakes and snowmen. 4. To finish off your look, I added a cardinal that I had leftover from another card project (these are a multipack of Jolee's cardinals). The sentiment is part of another stamp that I stamped in Versamark and heat embossed with red glitter embossing powder. I cut it out with some fine point scissors and adhere with a foam dimensional dot. 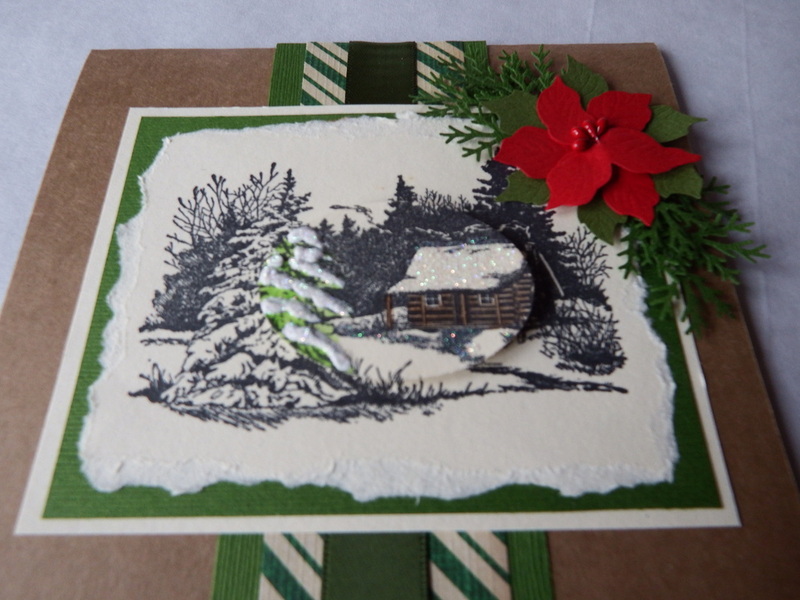 Today's Christmas Card of the day is a card featuring a cabin and winter scene with coloring and 3-D snow added for texture. This technique some of you may know as a form of "spotlighting" that was popular a number of years ago. I wanted to give old life to an older technique and make it relevant for today. This works great if you aren't comfortable with coloring your entire piece or just don't feel like coloring all of it. Let's not waste anymore time and let me tell you how to make your very own! 1. First, cut out and fold your cardstock base (notice my use of kraft again. Told you I can't get enough of it...and there will definitely be more of it on the remainder of the countdown!). Next, cut a coordinating piece of printed stock or paper and mat it with a solid color, using a piece of matching ribbon over the middle of the two, this should create the nice series of stripes running the length of the card. 2. Stamp your image on another, lighter piece of coordinating cardstock. One of your images will be the base picture while the other you will need to punch out in a shape of your choice; the section you will be coloring and embellishing. 3. Color your punched scene. For mine, I used water color pencils and a blender pen. Then; using a glue pen, I added glitter to the rooftop of my cabin. Lastly for this part; I added dimensional snow using a product called "Snow Writer". It comes in a small bottle with a very pointed nozzle, allowing you to put it on very precisely. I sprinkled glitter on to my snow before it dried to give it a sparkly look also. 4. Tear or cut out your image and mount it on cardstock and mat again. After you've created all of your matted layers, adhere your embellished, punched image with a foam dimensional dot. 5. 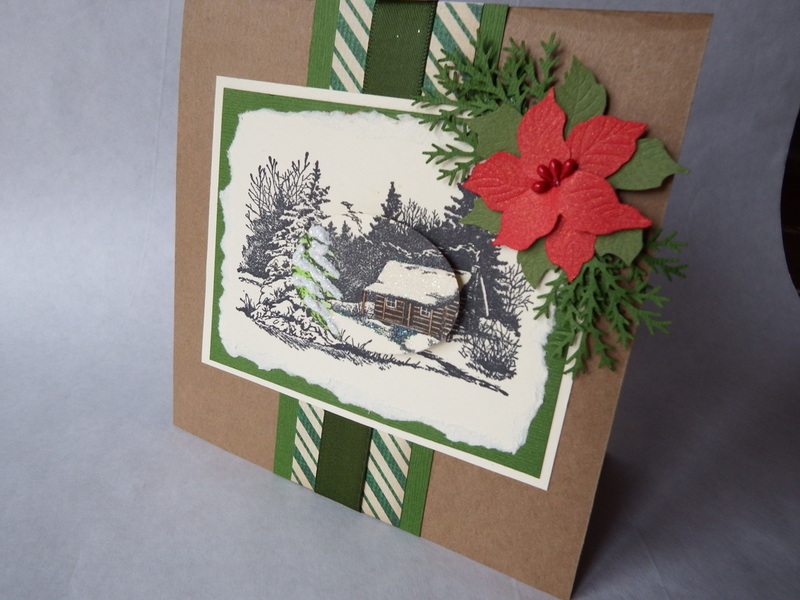 To create the poinsettia embellishment, I used one from a set of Jolee's embellishments and punched out the pine branches using the same Martha Stewart punch that we've seen already in use on other cards! Adhere these to the corner of your card and you're done! It was really difficult to get pictures that show the detail in the snow and color but I hope you can get the idea! So that is card #5! I hope everyone is enjoying seeing them as much as I do making and showing them off! Drop me a line, send me a pigeon, leave a comment, email me, you get the idea! Have an idea or suggestion or a topic that you would like to see? Let me know! Have a technique or topic that you would like a tutorial on? Let me know! If you know someone that would like to view the 12 Days of Christmas Cards or if you have your own blog; drop me a link so I can check it out! Today's card features only two colors and a bit of texture but not any loss of impact. If you haven't noticed by now...I am completely in love with kraft-colored cardstock! I use this color all of the time. It makes a great base color, mat choice and a great accent color. This color is very versatile. It can be used on a large variety of themes and color schemes. Back to the card...I love this card because of it's simplicity, how easy it is to make, and because it has pearls and rhinestones. I love all things that sparkle and/or glitter. 1. Start by cutting your cardstock of choice to create your card base. After creating the fold in your card, wind a small diameter of twine around the top of your card several times and make a knot with 2 tails. Place 2 pearls on the bottom of one tail and 2 rhinestones on the bottom of the other. Use a sponge or paper towel and white pigment ink to go around the edges of of the card and sentiment, if desired. 2. Using at least one snowflake stamp and white pigment ink; stamp your snowflake image in a random pattern. I used two different stamps and used the smaller one to fill in smaller spaces in between the larger snowflakes. 3. Stamp your sentiment on an oval piece of cardstock with Versamark if you choose to heat emboss it. Add embossing powder and heat emboss if you choose to do so. 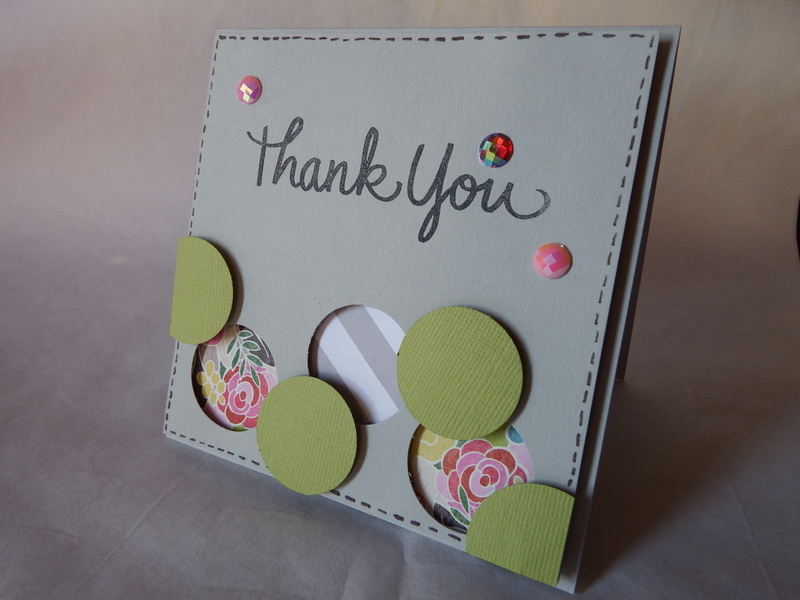 Using a foam dimensional; adhere your sentiment over the top of a smaller, scalloped oval punched cardstock. Place pearls in the middle to finish. 4. Using the same small twine; create a multi-loop bow and adhere the pearls and rhinestones to the tail ends of the bow and adhere bow to top corner of sentiment. 5. To finish off the look; place pearls and rhinestones in the center of random snowflakes. Today's card is as promised...a card easy enough for beginners and experienced card makers, alike. 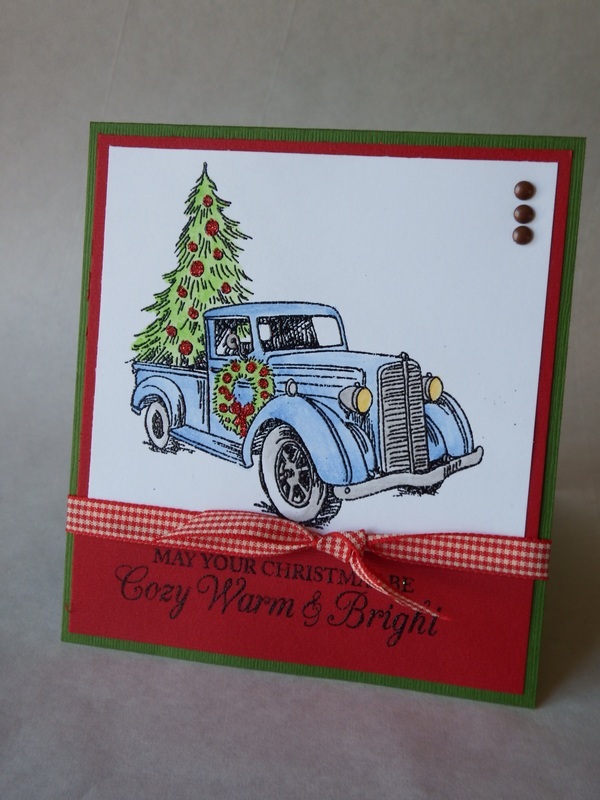 For this card I used coordinating vintage style paper. This card can be made in no time; allowing you to create several if you happen to have a large list. 1. Cut your base and adhere a mat that matches your coordinating paper but doesn't drown out the color too much. 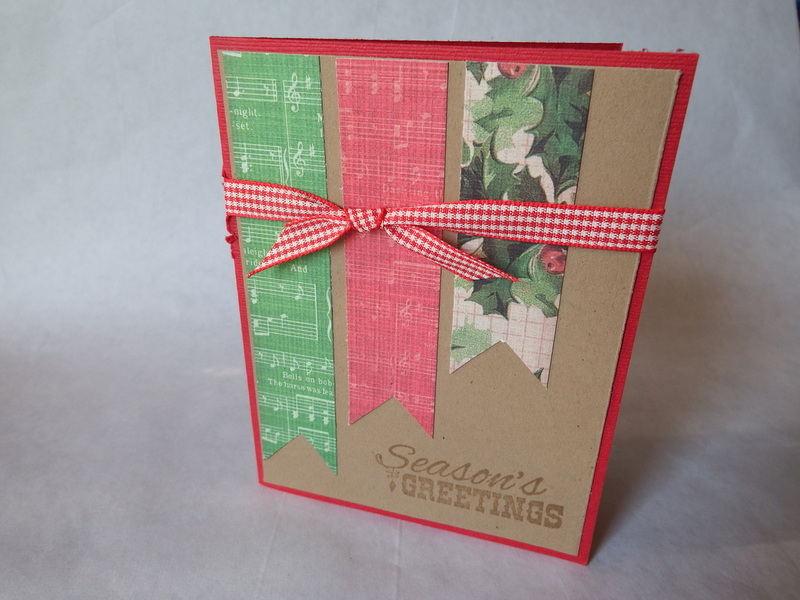 Go ahead and cut a small slit in the fold of the card where you will like your ribbon to go around. You can use one of your scissor blades or an exacto knife also works really well for this. 2. Create 3 small banner, each one progressively shorter than the previous. Go ahead and make a "V" shaped notch on the bottom of each one. Now adhere them to your matted base, evenly spacing them out. 3. Stamp your sentiment on the front. I used Versamark to give a watermarked look to the sentiment. To make this project more beginner-friendly; you could use a premade tag or other premade sentiment. This time of year is a great time to find tags and such to help save you time. Also a great idea if you have many cards to make! 4. Lastly, tie your coordinating ribbon, knot it and trim the ends to your desired length.